Wasn't sure I was gonna watch Ultra this year but Orb's involvement has me suitably interested. So why not I guess. A few more leaks have come out but what I find most amusing is that the logo is pretty much literally Ultraman Orb. Clever. Am I the only one that gets a slight Tiger and Bunny vibe off these two? Would not be surprised if they did not get along at first as most buddy narratives tend to do. But then again I like that kinda origin story as it is a nice way to start to build them as a dynamic duo of sorts. Your posts were the first thing that came to mind when I saw Blu's name! Absolutely. I hope to see some nice fight choreo that involves the two of them doing some combo moves or some synchronized fights. Say hello to our lead actors Yuya Hirata/Ultraman Rosso portrayed by Katsumi Minato and Ryosuke Koike/Ultraman Blu portrayed by Isami Minato. 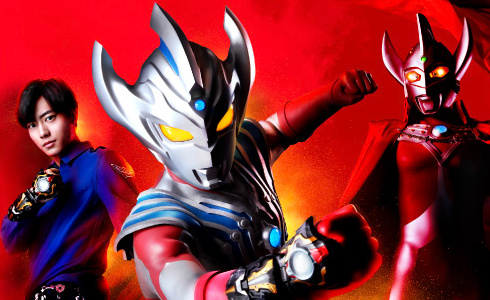 This will be the first Ultraman series where both lead Ultras are brothers.